The kitchen is most definitely Kelley's domain. She will be in there at the crack of dawn, kneading dough for homemade bread as early as six am, and still there, wiping the countertop and clearing away used pots and pans after a night of catering, as late as eleven pm. If you asked Kelley, she could list all her favorite things about her kitchen. Maybe the huge center island or the skillet top and drawer of spices and oils. Really, I bet a chef's description of their kitchen would be akin someone's description of their significant other. As the photographer-half of our little food blogging duo, I have my own little list of favorites in the Sullivan kitchen. The abundance of natural lighting, the windows...oh the windows, the cook books and copies of Bon Appétit Magazine, the white marble countertop, and the lack of fluorescent lighting. I also love the little touches of personalization. Fresh mints and herbs sit alongside the stovetop, and the fridge is replenished by daily trips to the grocery store. Yes...daily trips. Like any European epicurean, Kelley purchases groceries daily and typically only groceries for that day. Sometimes Edible Selby lies about, more often I spy a copy of Kinfolk Table, but always, there is at least one laptop with a handful of recipes waiting in the tabs. The Sullivan kitchen amounts to good conversation, lots of mess, and delicious meals. With that lengthy intro, I wish to discuss one of my favorite little details in the Sullivan kitchen: the homemade spice rack. 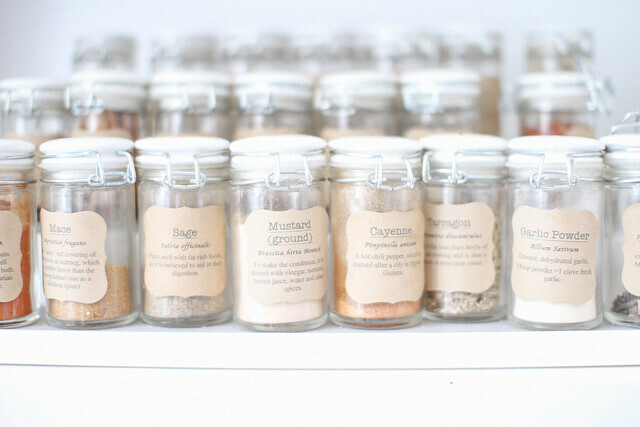 Kelley bottled and packaged her own spices, created her own labels, and you should do it too! You can find little glass bottles at Hobby Lobby, Michael's, or the Container Store. You can choose from one type of lid/top you would prefer. I have also seen spices kept in beakers with a cork stopper. The spices can be purchased in the bulk foods section of Whole Foods or Central Market. 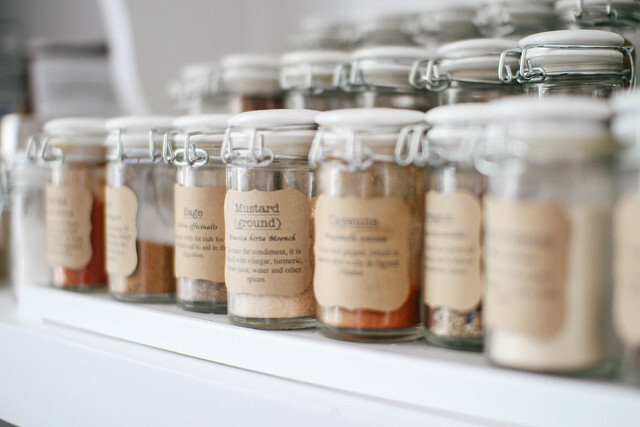 When you go in to purchase your spices, try to have a good idea of the size of your spice jar or container. Also, it might be a good idea to take a list of your favorite spices to use while cooking. Sometimes, the bulk section becomes overwhelming. 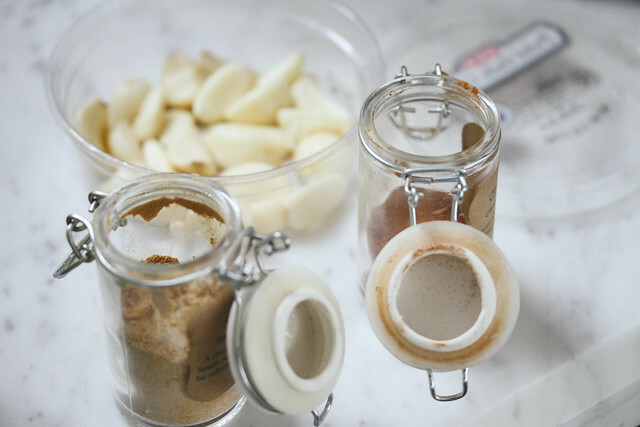 Once you have your spices back home, use a funnel or a spoon to transfer the spices into their respective jars. Make sure you also have your labels ready to go so you do not mistake the various spices. Finally, display your spices on a rack or simply begin cooking. 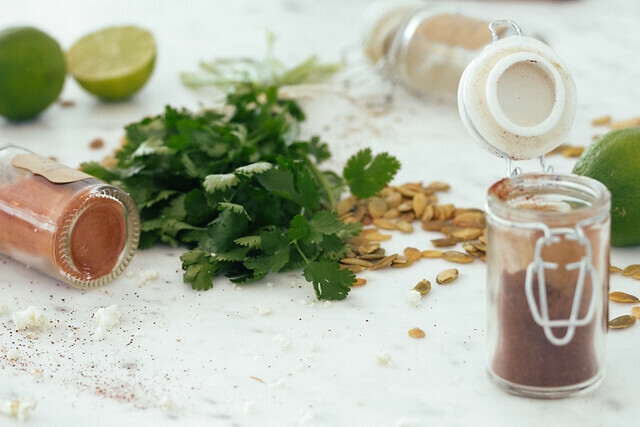 Many spices also pull double duty: they make your food taste great and they make you feel great. Ginger helps with nausea, mint provides headache relief, and several various spices help with general digestion. Cinnamon can lower your blood sugar and your cholesterol. Paprika's antioxidant properties can help prevent cancer. Cayenne pepper is known to cleanse/detox and neutralize acidity. So why not "spicen" things up and add a dash of this and that to your next meal.